Regulating your home’s temperature is next to impossible without a heating and air conditioning system. Most homes rely on HVAC systems for control of comfort but not many understand the fundamentals of how it works. It’s important to learn the basics of an HVAC unit in order to address simple issues and to communicate better with your installation contractor or repair technician whenever necessary. What Is a Centralized Heating and Air Conditioning System? A Central Air Conditioning system is categorized under the forced air distribution type. Many of its components, including the motor, blower, and even the vents and ductwork, handle both the heating and air conditioning of your home. The concept behind its ability to cool down your home’s environment is pretty simple and straightforward. The system draws in warm and humid air from indoors and “pumps” it outdoors, while at the same time, draws in cool and dry air from outside and “pumps” it inside. Many central heating and air conditioning models will have different additional features, depending on the brand, but all of them will have the same basic parts. Two of the major components are known as the condenser and the evaporator. You’ll find your unit’s condenser outdoors. It’s typically installed on a slab of concrete which allows for easy access in case repairs are needed. Indoors, your evaporator is in charge of drawing in warm air and pumping out cooled air into your home. Most homes will have their evaporators inside a dedicated closet, an attic, or above the furnace. Like any part of your home, your central HVAC system needs regular maintenance in order to work at peak performance. 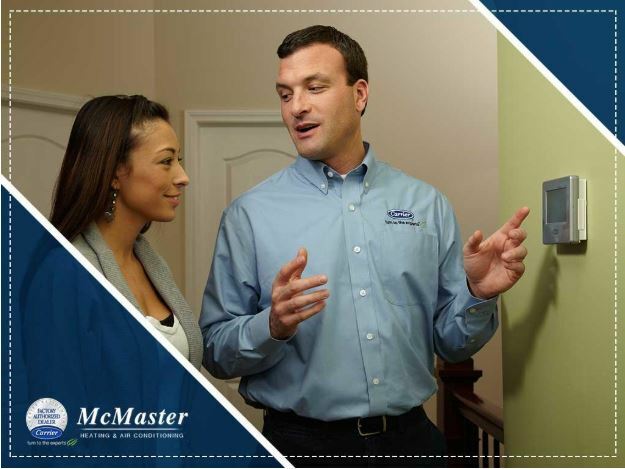 Give McMaster Heating & Air Conditioning a call today at (949) 441-5611, and ask us about our preventative maintenance packages. Services are available in Orange County and all nearby areas.